The following are examples of the standard courses that we recommend for both individuals and commercial clients, but we will be happy to discuss your needs and provide a programme with a content and duration to suit you. Day courses with lunch included can also be arranged. Stage 1 is a 2 hour course for own vehicle and up to three drivers/passengers. We start in the training room, and discuss the theories, the driving techniques, and some of the hazards you may encounter. We then go onto our off-road site where you will get individual tuition, driving through some of the conditions that you may meet driving off-road, and practising the techniques discussed in the training room. At the end of the course, a certificate is awarded to participants. Stage 1 Plus is a half day course for own vehicle and up to three drivers/passengers. Based on the Stage 1, this provides an extended training room session, and at the end of the on-site practical training, you can either spend more time driving on the site, or you can venture on an escorted tour of some local green lanes. This is our most popular course. (We have found that both of the Stage 1 courses are very popular as gifts, and we can provide gift vouchers). Stage 2 is a Half day course for own vehicle and up to two drivers/passengers. 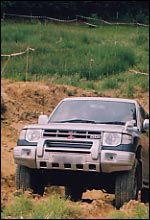 This is designed for the driver expecting to drive off-road regularly, either commercially or for pleasure, and requiring more detailed instruction and practical experience of some advanced techniques. Approx 90 mins. classroom instruction covering theory, techniques, vehicle preparation, recovery methods. Driving with individual tuition on our off-road course. Recovery exercises including towing, jacking, winching. Stage 2 Plus is a whole day course for own vehicle and up to two drivers/passengers. This is as the Stage 2 course but includes extended classroom and practical exercises, and the option of escorted green lane driving.